After doing a Snoopy nail art, I thought it is most apt to do a nail art of the most famous cat in the world next. 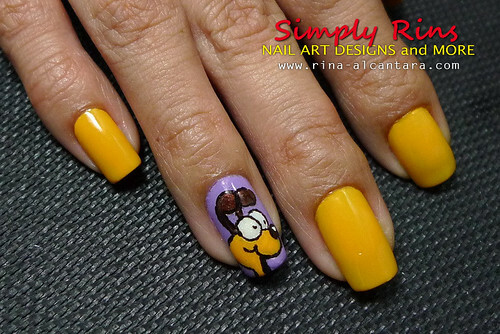 And so, I share with you another colorful nail design with my Garfield nail art! Yes, it seems like I'm into a cartoon mood this past few weeks. I have three (3) accent nails again for this design. 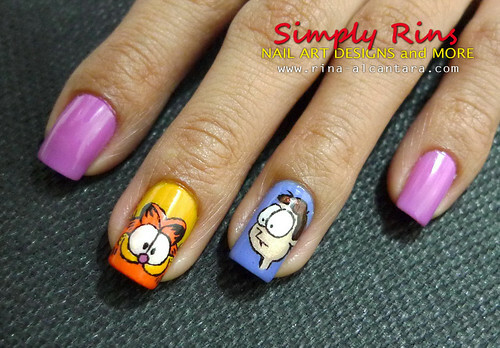 I painted Garfield, Jon, and Odie on 3 nails and left the others in plain colors. I also went a little crazy by painting different colors on each hand. I really like how this mani turned out. This is 2 coats each. Essie Splash of Grenadine on my thumb, pointer, and pinky fingernails, OPI The It Color on my middle finger, and OPI Suzi Says Feng Shui. 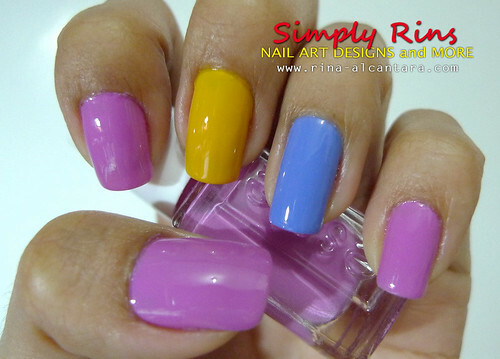 My right hand is dominantly painted with OPI The It Color with only the ring finger in OPI Do You Lilac. These were polished with 2 coats each. I intended this Garfield nail design to look dainty so I chose pastel colors. Anyway, Garfield is the second cartoon character that I memorized to draw when I was still a kid. Snoopy was the first. No, there is no meaning why I painted Garfield on my middle finger. 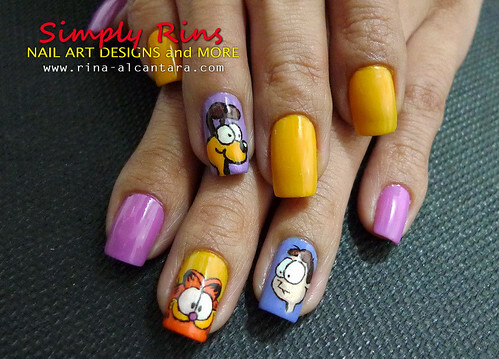 *grin* But I made sure that Garfield would appear fat on this nail art. Look! his face can't fit into my nail! I saw it fit that Jon be as close to Garfield as possible. He needs to keep an eye on our famous chubby cat. Odie monopolizes my right hand. He needs all the space for him to run around like a crazy dog. I hope you liked my Garfield nail art! Tutorial will be featured on a separate post. Those are great! How do you get them so neat? Do you use nail art pens or polish on a brush? This is amazing! You're so great with free-hand! another wonderful creation... I love Odie!!!!!! can't wait for your christmas designs! you're really good at your craft. I like your taste. To Sammersaurus, I use a brush for everything because I don't have a nail art pen. All outlines were painted using acrylic paint. I've received a few requests already on how I do these nail art designs. You may refer to my previous tutorials that actually have personal tips. OOoh Every time I come here I'm like "That's my FAVORITE!" <3 Great base colours too! I LOVE YOU GARFIELD!!! I read your comics strip everyday!!!! wah thanks for doing garfield Rins! you're the best! Thank you! :) Watch out for my Christmas nail designs for the whole month of December.